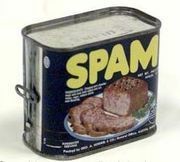 I've been having problems with spam recently so I've changed my spam settings. In this case it means that you won't be able to see your comment until I have approved of it. I guess that's why I had four posts from you a day ago or so ;-) Thank you by the way! All in all - I hope this won't prevent you all from commenting - as I L-O-V-E comments! Hi Sabrina! Yes I'm very familiar with the sketch! A classic if I may say so! And NO! You are not spamming my blog - You are making it feel more like home ;-) Thanx for commenting! Will you be coming to any of the Fridlund shows next month? Hope so! Yes, I will definitely go to the gig in Berlin. I'm very looking forward to it! Oh, that reminds me: I mustn't forget to buy the train tickets! =O See you there!